Am thoroughly enjoying Clay Shirky’s HERE COMES EVERYBODY – only half way thru still as I got interrupted by a number of other more urgent reading assignments. Will definitely be posting more on it when done. Horribly true – at times, the inbox feels like a river in spate, swelled by the melting of the winter snows, such is the accumulating pile of pebbles! But in a separate event this last week, I experienced something that could ONLY have happened in a web-linked world. Some of you are aware that for 6 months last year, I was working on an historical guide to All Souls Langham Place for tourists and others. The idea was to have something for the hundreds of people who wander in mid-week through the year (the church is next tothe BBC and sois included in a number of books like Rough Guide and Lonely Planet). We wanted to make it as glossy and attractive as a Dorling Kindersley guide, which meant that one of the biggest jobs was to find good images. 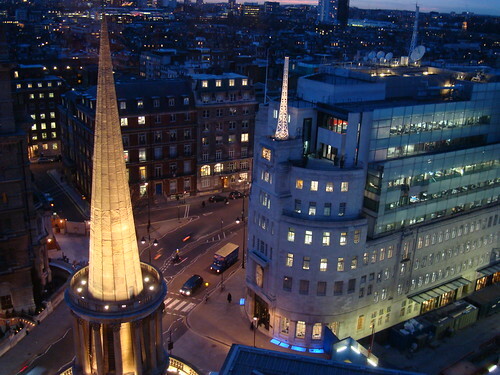 So naturally, I hunted around in Flickr for a bit – and came across this wonderful early evening shot – looking down on the All Souls Spire and BBC broadcasting house, from the St George’s Heights hotel. I contacted the photographer and asked if we could use it in the book – in exchange for a free copy! He very graciously agreed. It seems that he lives abroad but works occasionally for the BBC, which is why he had taken the pic. As we were having a reception to launch it formally last Friday, I invited him to come on the offchance, without really expecting him to be able to. But as it happens, he could – and did, and we were able to have a nice but brief chat in real time and space. Extraordinary. Only by the power of the web. Such a thing would have been barely possible even 5 years ago. That’s a brilliant photo – the Internet is at the same time wonderful and terrible. So much potential for good, yet at the same time capable of distraction and worse! I’m really appreciating the real life flesh and blood relationships that are being formed offline, and eventually becoming “real”.